We are offering SS Bellow. We are offering SS Bellow Hose. 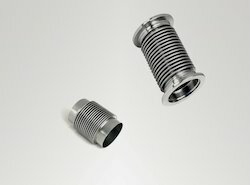 We are leading manufacturers of Stainless Steel Bellows. for pipe line misalignmen, and vibration isolation-with flange or direct fitting.Stainless steel, Carbon steel etc. Stainless steel bellows units for stress-free pipe installation and for avoiding transmission of vibrations, for gas, air and water, with restricting orifice if required, DIN-DVGW tested and registered. pe: max. 4 or 10 bar. Our offered range of products is inclusive of high quality Stainless Steel Bellow. This bellow is manufactured using premium quality components and is acclaimed for its hardness and strength. 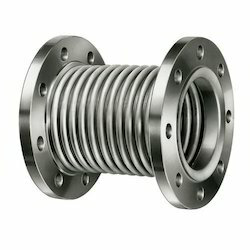 In order to fulfill the ever-evolving demands of our esteemed clients, we are engaged in providing an optimum quality array of SS Flexible Bellows. Gaytri Metallic Bellows widely used in industries for mis-matching of pipe lines and expansion joints. Design based on EJMA standards. - Unbraided Working Pressure given in table are one quarter of the pressure value, which will cause the hose to elongate and take a permanent set.